Although the Paradise Papers are exposing some rotten goings on in the world of big business, there is a lot more there that is not getting out to the light of day. The reason is that most of the world’s big media is hiding crucial parts and this is happening in Australia too. In the United Kingdom, newspapers like the Telegraph, the Daily Mail, the Sun and the Times, went so far as to jump to the defence of the Queen and attacked Labor leader Jeremy Corbyn, when he suggested that the Queens should apologise for her use of offshore tax havens. In doing so, they could ignore t that that billions have been robbed from the British people. There is a very good reason why big media would want to minimise the fallout and hide certain culprits, and that is that the owners are involved in the money laundering operations up to their necks. If you want to pick a stand out, none pits better than Rupert Murdoch. He owns the Sun and the Times. He is also happens to be the biggest media owner in Australia. The Queen has received a slightly bigger mention in Australia. Alongside this there has been a focus on Michael Hutchence, the Russians, Lewis Hamilton, Nicole Kidman and Keith Urban. There has been some mention of Apple, Nike and Glencore. It remains a sanitised version of the story. Evidence of this is the failure to mention the involvement of KPMG, Deloitte, PwC (PricewaterhouseCoopers) and EY (Ernst and Young). Why is this important? Because these are the big four advisers that are essential to setting up the conduits that siphon out the money from countries of operation, to its final tax-free destination. The Paradise Papers would not exist without them. There is an association between them and Appleby, the law firm named at the centre of the scandal. By the way, this form of assistance provided by the big four is known as “offshore services”. To cover this up is nothing short of censorship. Take Rupert Murdoch’s empire. EY is NewsCorps’ auditor and has assisted in you guessed it, avoiding paying tax. According to a report in the Sydney Morning Herald last year by Michael West (6 April), NewsCorp paid virtually no tax as it took $4.5 billion out of Australia. The other incentive for limiting the exposure of the Paradise Papers is that many business partners and major advertisers stand to lose a lot if the news of their involvement gets out. For instance, Apple is with EY, Glencore Australia is with Deloitte, Nike with PwC, as are the Bank of America, notable global money launderer, British bank HSBC, Goldman Sachs and JP Morgan. We already know from Australian Tax Office that at least two thirds of large companies operating in Australia don’t pay tax. More investigation is needed. It doesn’t stop here. The picture is not complete without shedding some light on banks, the Commonwealth, Westpac, ANZ and NAB. These are respectively linked to PwC, PwC, KPMG and EY. And it goes further than this. Interests associated with disgraced HSBC is directly tied in as the major shareholder in each bank. Citigroup and JP Morgan also have a large stake in each. No more needs to be said. Even without these direct links. Corporations seeking to transfer funds needs to use banks. The use of tax havens would not be possible without their involvement. 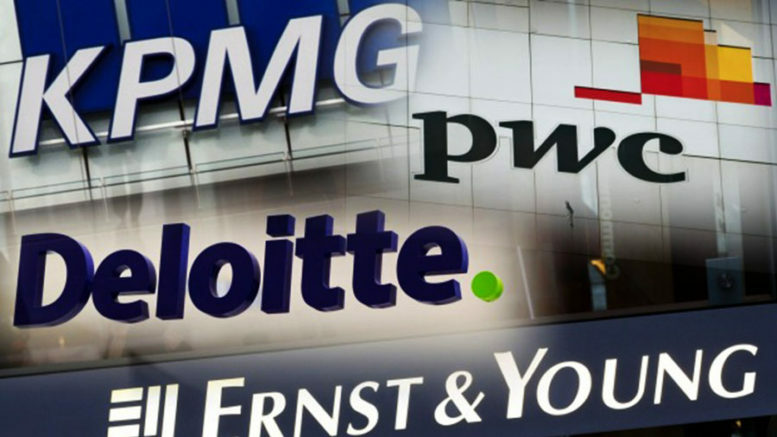 Even the Australian government is involved, through a host of consultation contracts with KPMG, PwC and Deloitte. This is not to suggest that it is itself directly involved in money laundering, but that there is a conflict of interest, which is bound to lessen the chances that it will genuinely tackle the problem. Our big media says nothing about any of this. It does not mean that the problem should be ignored. The huge amounts involved means that the rest of us gets pay the cost through the loss of taxation revenue, which translates into cuts to government services. In effect, the big end of town has its hand in our pockets for no good reason at all and this is wrong. Our politicians need to be told to do something about it or we will have good cause to regard them as part of the problem. Be the first to comment on "The Paradise Papers involves much more than a few celebrities"